In recent years laser vein removal has advanced to a point at which doctors can now offer cost-effective treatment to patients. This revolutionary new laser treatment can quickly, gently and safely eliminate veins on your thighs, calves and ankles. A detailed description below will let you know the process and what to expect during treatment. Is the procedure of removing laser leg veins safe? There are a few uncommon risks associated with laser leg vein therapy. These include pigment changes and blistering. 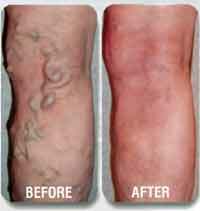 The occurrence of these events when doing leg vein treatments is rare. Who are the best candidates for laser leg vein removal? Those individuals with dark veins and light skin color respond most optimally. In people with a darker skin color, the skin tends to compete with the hair and veins for light energy, resulting in the potential for damage to the skin. What preparations must be made before treatment? There are no changes in activities, before or after leg vein treatment. Prior to and following any leg vein treatment, you must limit your exposure to the sun. Treatment should not be performed on tanned skin. What is the process of removing leg veins? Laser leg veins can be removed with highly controlled flashes of light that are selectively absorbed by hemoglobin found in red blood cells in the veins. The absorbed light heats the hemoglobin, causing the blood to clot. The vein then collapses and is slowly removed by the body’s natural filtering systems. As the laser is not absorbed by the skin around the veins, there are no scarring or visible marks left by the laser. The treatment time will vary depending on the number and density of veins to be treated. After having a consultation with a physician, he should be able to access an approximate time of the procedure. A pulse of laser energy feels like a pinch similar to a snapped rubber band. Most patients describe a tingling sensation during the brief time the laser is actually firing. Cooling gel or topical anesthetic cream can be used to minimize the pain. Many leg veins need multiple treatments, often over a few months before the effect is complete. Even small vessels often require time to resolve. Typically, you can expect three sessions or more to achieve the appearance desired. Are these vein treatments permanent? The removal of spider and reticular leg veins is not an exact science. Most patients achieve a significant reduction in the appearance of their veins and are very satisfied with the treatments. Doctors recommend a single yearly treatment if any new veins have started to appear. What kind of results are to be expected? Some immediate improvement is typically visible, with the leg veins, blotches and/or blemishes disappear over two to three weeks. Between 70-90% show a reduction in small leg veins that can be seen after two to five treatments. It is best to wait approximately six months before final evaluation of the procedure. Complications, such as scarring, bleeding and pigment loss, are very rare. Most patients return to their regular routines quickly with virtually no care needed afterwards. Many people experience some redness around the treated area, similar in appearance to a mild sunburn. This usually goes away in a few days. How much does each individual treatment cost? Varying on the physician, the price can range from $150-$400 per 20-30 minute session. As with any medical procedure being performed, you should consult your doctor and see if he or she can give you any recommendations to a physician that can remove laser leg veins. If you are unsure of anything, don’t be afraid to ask, they will gladly walk you through the procedure and give you an understanding of what to expect.